How do you put into words your appreciation for their unselfish service? Written by Richard. Vincent. Rose., taking over 15 years to write, the words say exactly what you want to say … and then … be stunned by Who actually wrote the letter! 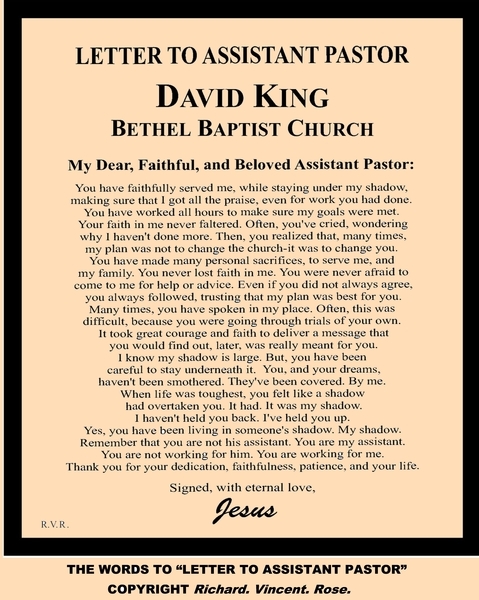 It begins as an intimate thank you letter which appears to be written by the Pastor … then, as you continue to read, you realize just Who is writing the words!!! Then, realize that the entire letter is written in the form of a chalice, representing the “pouring out” of one’s life in service to others. making sure that I got all the praise, even for work you had done. You have worked all hours to make sure my goals were met. Your faith in me never faltered. Often, you’ve cried, wondering why I haven’t done more. Then, you realized that, many times, my plan was not to change the church-it was to change you. You have made many personal sacrifices, to serve me, and my family. You never lost faith in me. You were never afraid to come to me for help or advice. Even if you did not always agree, you always followed, trusting that my plan was best for you. Many times, you have spoken in my place. Often, this was difficult, because you were going through trials of your own. It took great courage and faith to deliver a message that you would find out, later, was really meant for you. I know my shadow is large. But, you have been careful to stay underneath it. You, and your dreams, haven’t been smothered. They’ve been covered. By me. When life was toughest, you felt like a shadow had overtaken you. It had. It was my shadow. I haven’t held you back. I’ve held you up. Yes, you have been living in someone’s shadow. My shadow. You are not working for him. You are working for me. Thank you for your dedication, faithfulness, patience, and your life. Tagged assistant pastor, associate pastor, Christian appreciation, letter to assistant pastor, Richard.Vincent.Rose. Tagged best stories, hut on fire, quotes for Christians, shared email stories, words for daily living. We wanted to share this short message with you from Gregory Dickow, founder and pastor of Life Changers International Church. “Do you need something to change in your life? Maybe in your finances, your family, your emotions or your health? Well it’s easier than you think and easier than what most people will tell you. But the truth is: the power to change doesn’t come from anything on the outside. The only pathway to true transformation is from the inside out. Every day we make the choice to accept whatever thoughts come to our mind, or to fill our mind with God’s thoughts through His Word. Proverbs 23:7 says, as a man thinks, so is he. Therefore what we fill our mind with shapes our entire life. Real change begins by simply filling your mind with God’s Word. Then it is the power of God’s Word that transforms you from the inside out. Romans 12:2 says “…BE TRANSFORMED…” This is not something that happens BY you. It is something that happens TO you. As you renew your mind to God’s Word, your life begins to supernaturally change. Before you know it, you begin to think differently, see yourself different and treat others different. Before you know it, success and prosperity begin to cling to you, simply because of the way you think. The older I get, the more I enjoy Saturday mornings. Perhaps it’s the quiet solitude that comes with being the first to rise, or maybe it’s the unbounded joy of not having to be at work. Either way, the first few hours of a Saturday morning are most enjoyable. A few weeks ago, I was shuffling toward the basement with a steaming cup of coffee in one hand and the morning paper in the other. What began as a typical Saturday morning, turned into one of those lessons that life seems to hand you from time to time. Let me tell you about it. I was intrigued and stopped to listen to what he had to say. You could have heard a pin drop on the band when this fellow signed off. I guess he gave us all a lot to think about. I had planned to work on the antenna that morning, and then I was going to meet up with a few hams to work on the next club newsletter. Instead, I went upstairs and woke my wife up with a kiss. On the outskirts of town, there was a big old pecan tree by the cemetery fence. One day two boys filled up a bucketful of nuts and sat down by the tree, out of sight, and began dividing the nuts. “One for you, one for me. One for you, one for me,” said one boy. Some were dropped and rolled down toward the fence. Shaking with fear, they peered through the fence, but were still unable to see anything. The old man and the boy gripped the wrought iron bars of the fence tighter and tighter as they tried to get a glimpse of Satan. Quicker than you can bat an eye, the old man was gone, made it back to town a full 5 minutes before the boy!